← An activist you are! Sunday morning, May 24th: I am having breakfast with a life-long friend, Ivar Ekeland, at his kitchen table in Paris, France. He was just back from Oslo, and was telling me about the ceremony for the 2015 Abel prize, he had just attended. He was invited a few weeks before as a member of the Norwegian Academy of Science, and had declined. 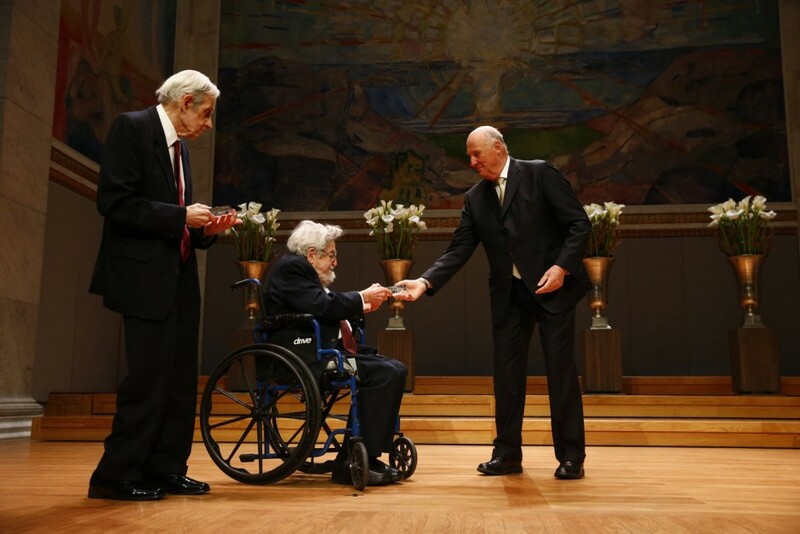 But once he knew that John Nash and Louis Nirenberg would be sharing the prestigious prize, he scrambled to get himself re-invited. He didn’t want to miss the historical event involving his friends and idols, who happen to be two of the most beautiful minds. Louis received an honorary doctorate from UBC in 2010, a very special day for me and for three of my PhD students, Amir, Craig and Ramon, who had the honor of shaking his hand on stage, while receiving their diplomas. For Louis is a giant of their field of research and mine, Partial Differential Equations (PDE). I couldn’t help wondering if the King of Norway had the same trouble as our Chancellor at UBC, in trying to explain to the crowd, what those PDE creatures look like. John Nash is the “beautiful mind” of the movie that carries that title. Life Magazine called him the genius of the century, back in the fifties when he was the genius of the century. But that was before a mental illness robbed him and humanity of his genius. Listen to my friend, Jim Colliander, talk about that side of creative powers. Nash was eventually awarded the 1994 Nobel Memorial prize in Economics for his work on mathematical game theory, which had become over the years a cornerstone of the modern theory of decision-making. It is Nash’s work in geometry and partial differential equations that “the mathematical community regards as his most important and deepest work,” according to the academy. Not that soft game-theory stuff! Actually, it was Louis Nirenberg, who had suggested the outstanding PDE problem to Nash many decades ago, and it didn’t take long for the amazing mind to solve it. Ekeland kept raving about the ceremony, the beautiful camaraderie between the two men, who were about to share the big prize, after having shared a whole life of agonies and triumphs. And as expected, he had stories about Louis’ notorious wit and sense of humour, always landing at the right time to save the day from those awkward moments, a permanent feature of our tribe’s social life. Sunday afternoon, May 24th: My train had just arrived to Nancy, France and my twitter account started lighting up with the horrific news that John Nash and his wife, Alicia, were killed in a car accident. Fate wouldn’t leave these two great men alone basking in their glorious destiny together, after more than 60 years of togetherness. Louis, John and Alicia had flown back home together from Norway. Louis’ ride was one hour late coming to pick him up at Newark airport, and since he is confined to a wheelchair, John and Alicia decided to keep him company until his ride arrived. That was their last hour together, and the last act of kindness of the beautiful mind. Soon after, John and Alicia took their fatal Taxi ride to their home in Princeton, while a grieving Nirenberg had to fend off a barrage of reporters eager to get him to say a few precious words about his life-long friend, who could finally rest in peace. John Nash had planned to be with us at this upcoming conference in Italy, next September. Now, it will be a tribute to his legacy. This entry was posted in Honouring friends and tagged Abel Prize, Ivar Ekeland, John Nash, Louis Nirenberg, Nobel prize Economics. Bookmark the permalink.